Robert Kaplan has reported from locales as diverse and chaotic as shantytowns in the Ivory Coast, death camps in Cambodia, and the front-lines of the war-ravaged Balkans, but his most challenging assignment may have been covering his own country. 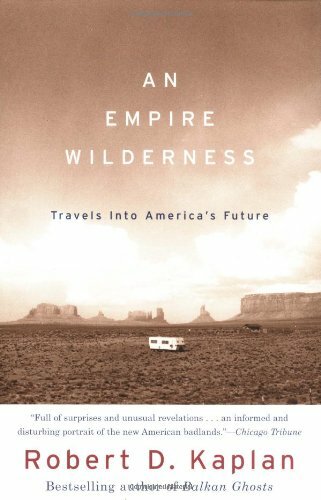 In this ambitious and evocative study, Kaplan vividly chronicles his “travels into America’s future,” a journey that begins in Fort Leavenworth, Kansas–“the starting point for what would one day be called Manifest Destiny”–and continues across the West, where the population is growing faster than anywhere else in the country and multiple American identities reveal a nation in flux. He explores cities such as St. Louis and Omaha, Nebraska, that typify the increased urban fragmentation of the heartland; onward to Tucson, Arizona, and Santa Fe, New Mexico, where great wealth and poverty exist cheek by jowl; through the sprawl of multi-ethnic Southern California, where the landscape is perched somewhere between urban and suburban; and up through the Pacific Northwest into Canada. He also visits towns along the U.S.-Mexico border, dipping as far south as Mexico City, to investigate the conditions driving so many Mexicans north, despite feverish efforts by the U.S. to keep them out, and the new cultural hybrid being formed by this migration.